I found a used copy of this amazing release at Permanent Records in Highland Park, California. What a find...for only $3.99! I had never heard of this artist before, but the label (Water) and the packaging strongly suggested it might be interesting. Wow, what an understatement! After two spins...it's fantastic. Pink Floyd influences...sure, I get it. But, Battiato are risk-takers, and what a pay-off. The second listen struck me: could this artist be on Steven Stapleton's legendary Nurse With Wound list? Not surprisingly, they are! Highly recommended. A very unusual release from a very unique artist. I also own Battiato's previous album, Fetus, which is an interesting album of electronic, avantgarde pop. Pollution is a worthy follow up that exceeds the debut in many ways. The albums progresses in a montage of musical cues that go from synths awash with chaotic bursts immediately followed by melodically folky moments. And then suddenly, there is a classical break intermixed with field recordings that soon lead their way into a jam that rocks around for awhile. Battiato is a bit hard to pinpoint musically but he's a treat to listen to and this release from Superior Viaduct does him a great service. The packing is of high quality with hard stock, complete with an impressive gatefold and trippy inner sleeve notes. Most importantly, the mix is carefully done and plays dead quiet. Highly recommended. Taken from vinyl. You can hear a clic or two too. Second album Pollution followed the same route of Fetus with a minimalist sound mainly based on the use of a VCS3 synth, unusual lyrics, complex arrangements. Anyway the sound was a bit richer with a larger use of traditional rock instruments. 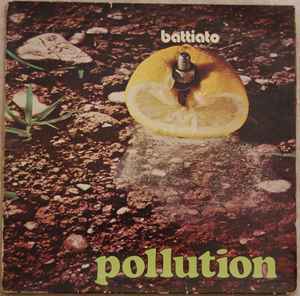 Fetus and Pollution are considered Battiato best records for prog fans.